Well, after losing my old phone and having my Sony Clie decide to die, this is what I got to replace them both. 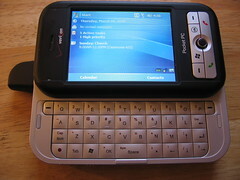 I’m still a bit ambivalent about it using Windows Mobile 5, PalmOS 5 seemed a bit more refined, if more limited. And I miss the half-vga (320×480) screen of my Clie, this is only quarter VGA (320×240) and I notice the difference when reading ebooks. On the other hand, this supports EVDO, WiFi and Bluetooth, so it’s much easier to be always connected. I was able to find replacement Bible and ebook reader software, they work ok, but not quite as well as their PalmOS counterparts. I have found quite a community of people dedicated to getting the most out of the device though, so I’m having a bit of fun hacking the software to make things work more the way I’d like them to. All in all, I’m pretty happy with it, it’s a good PDA and a reasonable phone to boot (but it’s definitely a PDA first and phone second). It does what I need it to and has plenty of hacking potential as well.